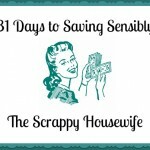 When Adam and I agreed that I would stay home (I’m a lucky girl) I realized that I while I wasn’t bringing in any income (this was pre-virtual assisting), I would need to make it my job to save our money and I dived into extreme couponing with a whole heart. Now, don’t get the wrong idea – I’m not clearing shelves or adding rooms to my house to stockpile four thousand boxes of ramen – far from it. Still, I try and stock up on things at their rock bottom price and I love, love, love saving money. I used to spend hours clipping and filing coupons into my (ridiculously large) coupon binder and then hauling that bad boy to the store. Yeeeeeeah, carrying that thing around grew old pretty fast and so did giving up my Sunday afternoons to clip, clip, clip coupons. It was just too much. You guys know that these days I struggle a lot with feeling overwhelmed when a task seems way too big. That’s why I’ve made it my mission to simplify just about everything in my life – my couponing included. Let’s take a quick close up look at how I label my folders. 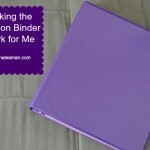 I’ll be sharing more on my binder and just how I clip and prep my coupons later – but trust me, it’s just as simple! Great tip, Christina. Using the dry erase marker is brilliant! Such a great tip! I would have never thought of that. 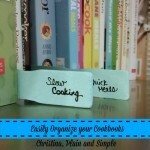 Thanks for linking up to the Tips & Tricks link party. Pinned! Pingback: Turn It Up Tuesday - #76 - Baby Doodah! I’ve been overwhelmed by couponing in the past. Your simple system is something I can actually manage. 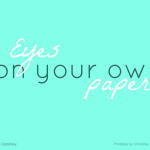 Thanks for sharing at the This Is How We Roll Link Party on Organized 31.
very interesting. 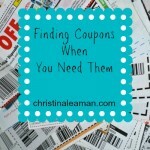 I used to coupon…but the coupons are so few and far between of ones I have use for, it is hardly worth it anymore. And stores here in Calif don’t ever double. But I watched you video..seems like a great idea! Thanks for stopping by Cheri!